The excitement is building for the FIBA World Cup, but even at this late stage, players are dropping out with injuries. This has been one of the most consistent stories in the build up to the World Cup and NBA fans must dread reading the morning news stories. While there are plenty of fans that would be delighted to learn that their players are not involved with the World Cup, missing out because of injury is not good news for the player, club or fans. The latest set of fans to receive bad news about one of their players that was headed to the World Cup are the Pacers. This is because there have been breaking stories about Ian Mahinmi having to pull out of the French team. It is believed that the Pacers player will no longer be part of the French squad for the 2014 FIBA World Cup, which gets underway on Saturday the 30th of August. It is believed that the injury relates to a shoulder injury. This injury was picked up on Thursday during a training session. This goes to show that injuries can happen at any time and what was supposed to be a light warm up in preparation for the tournament has now thrown the plans of France out of the window. In sport, things can change very quickly and the amount of coaches who have had to rip up their playbook and start again this summer has been frightening. Team USA has obviously suffered the largest amount of call-offs this summer, but plenty of other basketball teams have found their squads reduced, and even decimated, due to injuries. Team France have missed out on a number of players this summer, with the team being denied the services of Alexis Ajina, Nando de Colo and Tony Parker. When you think that Parker was hailed the FIBA Europe Player of the Year, this is a huge blow. It is believed that France have recalled Kim Tillie to the squad and it is not as though the French team, who won the 2013 EuroBasket, are short of class players. With players like Rudy Gobert, Boris Diaw, Nicolas Batum, Evan Fouriner and Antoine Diot, there is still a lot of class in the French squad. France have been placed into Group A this summer, which means that they will be pitting their wits against Spain, Servia, Iran, Egypt and Brazil. The clash with Spain should be an exciting match, and the game against Servia will also be tricky. Most people expect France to qualify from the group stages without too much trouble but it is what happens after there that will be interesting for French basketball fans. With Spain and France being in such close proximity, you have to expect plenty of French basketball fans to make the journey to support their team, which means the organisers will be looking for France to progress in the tournament. 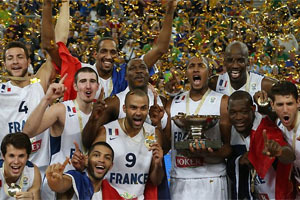 There will also be plenty of fans placing bets on France at the 2014 FIBA World Cup. The betting markets for individual games are now open, so whether you want to back the French for tournament success or in their individual games, the opportunity is now available. Mahinmi has already taken to social media to express his sorrow about being unable to play in the 2014 FIBA World Cup, and he has wished his team mates all the best. Given that the Pacers have also seen Paul George miss out on the FIBA World Cup, their fans will be left watching Luis Scola and Damjan Rudez, playing for Argentina and Croatia respectively, this summer. Si près du début de la compétition, cest vraiment dur… Je suis de tout coeur avc mes potes, j'espère qu'ils iront loin.